The p70R control head with a rotary knob, type 1 hydraulic pump, and a Seatalk NG backbone kit are also included in the box. Before we start, there are a couple of things about this autopilot system you need to be aware of. This system is designed to use Raymarine's Seatalk NG, aka NMEA 2000. The ACU, and EV1 have no provisions for interfacing to legacy NMEA 0183 wiring. You can accommodate NMEA 0183 by purchasing a NMEA 0183 to NMEA 2000 gateway like Actisense's NGW-1-STNG which includes the Raymarine network adapter cable. Also be aware that the included Raymarine spur cables are fairly short, especially for the EV1 sensor core. In my case I had to purchase a much longer cable. This wasn't a problem because this was part of a larger system that included two e165 MFD's, and I could use the cable elsewhere in the configuration. The sensor core looks like the front end of the star ship Enterprise. It has two underside connectors. One is for Seatalk NG, and the other is a device net connection used for interfacing to Volvo's IPS or other similar drive systems. The spur cable only fits in one of the connection points so you can't mess it up. The EV1 can be flat mounted, and comes with a wall bracket which I used. There is a template, and you need to use it because the mounting screws are recessed. There is a small wart with the template. It is for the bracket only. I was mounting the sensor in a corner. 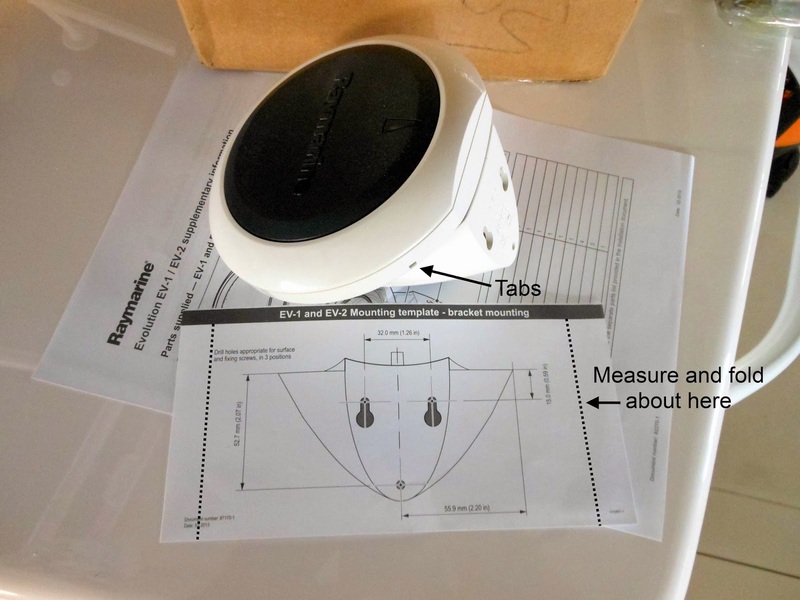 This meant I had to measure the width of the sensor, and fold the edges of the template to put it in the right location. I think it would be a good idea to show the sensor edges on the template. I put a dotted line on the photo to give you an idea of about where the edge actually is. There are four small recessed tabs that release the sensor core top cover. You will need a jeweler's screw driver or the ilk to depress them. Assembly and mounting instructions for the sensor core are clear and easy to understand. In the kit are two foam O-rings, don't forget to use them. You will need a long screw driver/bit to reach the mounting screws. A compass appropriate location for the EV1 is required. It can deal with its environment better than many heading sensors, but don't bend over backwards to stress the system. It won't like being mounted next to the engine block at all. The ACU installation is a snap. Hang the box. Connect the Seatalk NG cable, the pump and power wires and you're done. There is a on/off switch and a power selector switch (12-24VDC). There is some minor minutia to be considered here. The included Seatalk NG backbone kit came with a red/black network power cable. The ACU-100 doesn't supply power to the network so you need it. All the other ACU's including this ACU-200 do supply network power. In sum you only use the power cable when you're using the ACU-100 only. What the heck, I installed the power cable anyway, and here is why. Although Raymarine's version of the NMEA 2000 network is slightly different, my sense is that N2K networks in general like it best when there is only one source of power to the network. But in a larger system, if you lost power to the ACU or it malfunctioned, you would lose the entire network. This would include the GPS, and a lot of other things. I wired in the network power cable, plugged it in, tie wrapped it up, and then I unplugged it and left it hanging right next to the block. In the event the ACU wasn't available, all the owner would have to do is plug the power cable back into the block to restore power to the network. Clever of me, and I didn't break any rules, this time. This boat was going to Angola Africa, and I wanted a back up plan. The repair trip charge would be an eye opener. Setting the system up is very intuitive and easy. When you fire up the system, the control head asks you to pick a language, and select your boat type from a list. Since this is a nearly 70MPH boat my choice is simple, Power (fast turn). If this menu doesn't show up, you can access it through Menu/Set-Up/Set-Up Wizard. You then navigate to the dock side wizard. The instructions show you how to get there. The first thing to do is to select the drive. In my case it's a Type 1 pump. This boat has a Verado power assist steering system. One of the options is "Verado steering". Don't select this if you're using a Raymarine hydraulic pump in the system. The other selections include rudder limit, and if you are using a rudder reference these settings appear in this section. 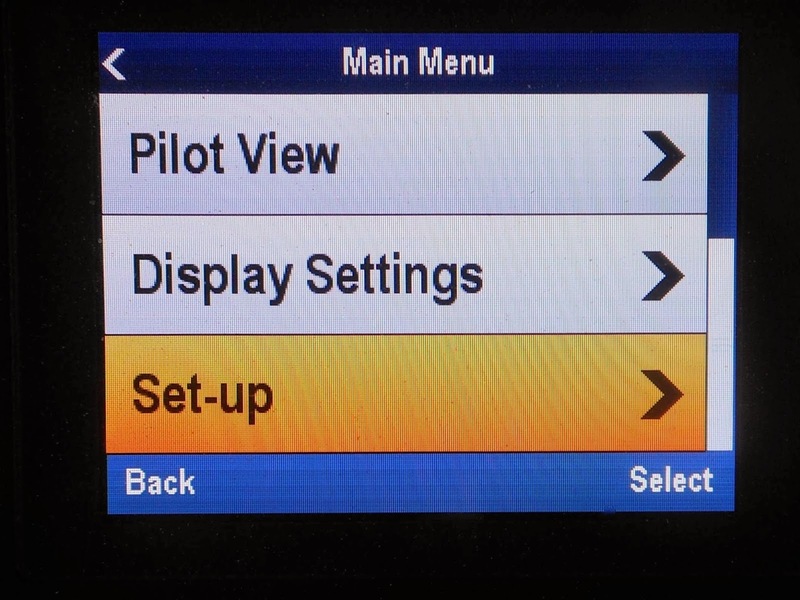 This is little different from the earlier Raymarine rudder drive menus. When you hook the pump wires up, you have a 50/50 chance it's backwards. The system moves the rudders/motors, and then asks you to verify the direction of travel, If movement is in the wrong direction, it reverses the drive polarity, and asks again if all is good. If so you're done. With outboards this can be visually a bit confusing. If the motors turn to port, you're actually making a starboard turn. The older Raymarine systems just asked in effect "Is the boat going to turn to port" which I think is a little clearer. The last major setting is the hard over drive time setting. It's important on faster boats that you pay careful attention to this setting. The factory default is 10 seconds. You use the system to drive the rudder/motors from full port position to end of travel starboard, and time it with your watch or smart phone stop watch app. You then double this number and enter it as your hard over time. What isn't intuitive about this setting is the larger the number the more aggressive the turn rate will be, and at high speeds if not properly set the turn rate could be precipitous, and too exciting. The lower the time in seconds the slower the turn rate will be. My fast boat is set at six seconds, and it works well. Test the performance at slower speeds to verify operation. In the end, if you're not happy with the rate of turn, lower the number until you're satisfied with the performance at normal cruise speeds. A way to do this is to set a travel speed like twenty knots, activate a waypoint, turn the boat away from the waypoint about 45 degrees, then engage the autopilot. The boat will turn to intercept the course line. How aggressively, or gently it turns is dependent in part on this setting. Again test this at slower speeds first. The last step is to steer on a steady COG heading, and tell the autopilot to accept COG as its heading. Done, fin, the end. I really like this system. It was very easy to install. Had a minimum of connections, and worked well right out of the box. The boat was splashed in the bay, and at thirty knots it steered straight as an arrow first time. No spinning in circles, and no further adjustments were required. It just worked period. I was one of the three NMEA judges that awarded the Evolution autopilot the 2013 "Technology" award. My experiences with installing and using this system has more than validated my decision. You will find a Raymarine Evolution buying guide here. Since the Evolution can be controlled from an MFD, did you by any chance see if it could be _configured_ from the MFD? I figure if so I don't need to install a redundant p70 just for config/commission. Anon, yes you can use the Ray eSeries MFD in lieu of the p70R autopilot head. 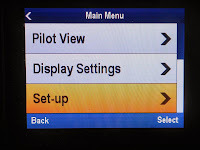 The set-up is included in the MFD menus. Why I ask ...Just did an E series pilot upgrade from an older seatalk 1 version pilot...The new Evo pilot is superior in many ways...Advertised to work with C and E series...however How do you interface to Legacy E series? ...if you use the STng to ST1 converter some data transfers , but some very important not...IE no GPS, speed , and several other very important data that would make this truly comparable..Am I missing something? E series is legacy, e series is predosessor of eS series. You never talk about installing the Type 1 hydraulic/Steering pump, which is the hardest part of the install. What type hose ? What type of tubing ? What kind of fittings. I've done over 100 autopilot install and its always the pump. Where to put. where to break into the system. Each boat has different size line/hoses and fittings. Anon, thanks, so many things to talk about, and so little time to do it. I agree the plumbing is the most tedious and messy (translated don't wear good clothes) of the entire process. Here are links to a few. I know I have done more, but I'm approaching nearly 400 stories it takes some time to dig them out. 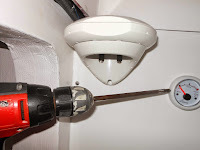 Here is a discussion of using paste or teflon tape for autopilot plumbing. And here is a plumbing heavy piece using a Garmin pump, and standard telflex steering system. Sid, here is some more info I acquired after talking to the techs at Ray. The message includes "E22158." This is the part number for a Seatalk to Seatalk NG converter. When this device is installed the software disables the option to select a data source. This is because the original Seatalk did not allow a data source function. The autopilot should opt to use the Seatalk NG via the Actisense, and the message you see is most likely advisory in nature. If not use the link below to go to to Ray's tech support forum, and provide a full description of the attached hardware in your system Hope this helps a bit. Is the message advisory? By that will the AP accept a route/WP and follow it. It's assumed your seeing the message on the Ray 70 series control head, yes? Sid, another piece of errata from Raymarine: The NGW-1 cannot convert NMEA0183 waypoints to N2K if the WP name or ID contains letters. So the Waypoint needs to be 001 or 002 or 123 etc. Not WP1. FYI.... keep the compass UNLOCKED when you plan to navigate across regions (AUS to NZ as I did). I forgot I locked mine for local sailing and set out only to have the EV1/ACU400/Jefa LD100 drop off line. From this experience I learned max deviation error will occur requiring a compass restart and calibration at sea. Very difficult to hand steer a 'steady' course at sea, especially in 5m seas, when completing the cal. I am attempting to connect a Garmin 741 Plotter to a Raymarine X-5 wheet autopilot. The Raymarine system has a ACU-100, EV sensor, P70 head and ST4000 parts. I have a garmin Nema 183 power wire to feed power into the 741, and also a Garmin NEMA 2000 cable for data connections. The Garmin andRaymarine NEMA 2000 cables both have red, black, blue, white and a bare conductor. Sinced the Garmin's power feed goes into it on their NEMA 183/power connection, I wonder if I shoud connect the bare red wires together on the NEMA 2000 wires as a power source also. Basically, I want to connect mt autopilot and plotter so that I can have the GPS steer me to a waypoint? Anon, the easiest (least expensive also) is to do the 0183 interface. On the power cord you will find a blue wire. Connect this to the NMEA in + port (up arrow) on the X-5 box Connect a black wire from the Garmin 741xs power ground connection to the X-5 box NMEA in - connection next to the other one. You're done You can do a N2K connection using a Ray STNG adapter cable, but this won't work any better, and will cost more. Do I have this right for you? It's all you have to do. if you want to do the N2K I will need some additional info. If you need to contact me my email is in my profile. The Raymarine t-ch support people tell me that the new X=5 autopilots do not support NEMA 183, only NEMA 2000 or the Raymarine communication system. If the Garmin also has a N2K backbone you can connected the two backbones together using either the A06045 or A06046 (male version) which ever is required. The network can only get power from one source, so one network power connection will have to be disconnected. One termination resistor must be located at each end of the two networks, so two of the existing resistors must be removed. Hope this helps. Bill, Thanks for all your research and effort in helping me sort this problem out. You deserve a gold star by your name. I finally reached a a Ray Marine tech guy that had actually installed stuff, not just talked about installing stuff. He said to use a both a Garmin and Ray plug to bare wire cable, and just connect the color to color wires and shields. The Garmin cable feeds directly into the 741 unit, the Ray cable feeds into the backbone. The Garmin itself is 12-volt powered on the NEMA 183 connector, but that is a completely separate cable. Ill hook this all up over the weekend and see if I can start a large fire or go safely by autopilot to a waypoint. Keep ya posted. Here is the final chapter on the Garmin GPS to Ray Marine autopilot saga. To spool everyone up to speed, I have just replaced a fifteen year old Autohelm wheel autopilot and a similar age Garmin plotter that were interfaced together with a NEMA 183 connection so that the GPS would supply a go-to waypoint for the autopilot. 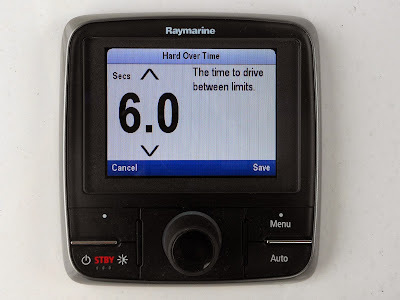 The Autohelm died late last year, and this spring was replaced with a newest generation Ray Marine Evolution autopilot, which would NOT accept a NEMA 183 input signal from the old GPS. I next replaced the older GPS/plotter with a new Garmin 741 plotter, but I had an issue getting the right instructions on how to connect the two different makes of units together so they could communicate with one another. I really wanted the GPS to provide autopilot waypoints, and was pulling my few remaining hairs out trying to get these two units to play nice with each other. Several people suggested they would not work together, others indicated a wrong connection might likely toast one or both of the units, and the most common thread was that that both Ray and Garmin spoke slightly different versions of NEMA 2000, so don’t expect this to work out well. Calls to Garmin and Ray did not offer much support, nor did a search through all the blogs related to marine electronics. Finally, I once again call Ray Marine and ask to speak with a high-level support guru. Fortunately the Ray guy on the phone offered to take a shot at resolving this issue prior to sending me up the chain. His suggestion was simple, elegant and so easy it was almost embarrassing. (Of note, neither Ray nor Garmin make a cable that will feed into the other’s equipment.) He said buy a Ray cable with connectors for N2K , and do the same for the Garmin unit. Since their respective plugs will not fit into their competitor’s units, cut off one of the plugs from both cables, and just connect the wires, red to red, black to black, blue to blue and white to white. Also connect the shields together as best as possible. Not too complex, but EXACTLY what I had been advised against by some of the experts. The Ray guy also stated that most phone support technicians only talk about connecting things and likely have actually never done the connecting thing themselves. Anyway, after connecting color to color, it all works, and I can now steer automatically to a waypoint. By the way, the Ray guys comment about different manufacturers speaking different versions of NEMA 2000 was the If they were not N2K compatible in language protocols they could not advertise that they were a N2K compliable unit. Anyway, Thanks for the suggestions, your blog helped save the day. Good job Joe, although there is actually cable that will do this, but I will be the first to aver it's hard to buy the cables right until you buy them wrong a couple of times. At first blush female looks like a male. If certified N2K is N2K despite whatever proprietary name the manufacturer uses. The last rule is when combining networks, there should be only one source of 12VDC power powering the entirety of the network and a resistor at each end. I now officially pronounce you to be a N2Kologist. Actisense NGW-1-STNG NMEA 0183 to Seatalk NG Gateway to make it work . Brian, the Evolution autopilot only has a NMEA 2000 interface so you will have to use the Actisense gateway. Your NMEA 0183 output is the pigtail on your GPS cable. This is port connection 3 going from left to right. I purchased and installed a new A200 autopilot for my 23' Everglades with one 250hp Yamaha. I cant get it ti work correctly. Ive just done an software update and i'm going to try again but these are the symptoms. 2 motor turns back and forth rapidly like a dog wagging his tail. Anon, things to check first. 1. Is the arrow on the EVO sensor pointed towards the bow, if not it should be. Make sure the compass is away from ferrous metals. 2. 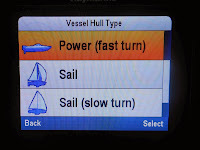 Your boat type should be "Power Fast Turn." 3. Set your hard over time to 4-5 seconds. 10 is the default. 4. Drive type is typically "Hydraulic Type 1 drive. 5. If you have a Uflex/Yamaha steering system with a Verado steering pump it's still a Hydraulic Type 1 drive. 6. Set the response rate to "Performance". Play with this using auto mode in calm waters for about an hour at lower speeds ie 10-20kts. The AP should learn to optimize the steering. Let me know if it doesn't. I have a 9.5m RIB fitted with twin 250 ETEC's. I recently had an EVO autopilot fitted along with MFD upgrades and many other gadgets. This included twin A98 MFD's, color radar, FLIR camera, 2kw chirp sounder with side and down vision transducers. All equipment was fitted by a Raymarine technician. I have done the dockside setup as you recommended, and have since changed every boat type, sensitivity, hard over combination you could imagine. The Ap will steer accurately to any cursor or waypoint, no matter what position it is in compared to COG, and no matter what speed the boat is going. Ask it to follow a route and it gets hopelessly confused, sometimes going around in circles. The evo sensor always sees the first waypoint, and the heading and distance appears accurate. I have reversed polarity countless times, thinking it is trying to steer in the opposite direction. The only difference being which polarity get it confused the fastest! 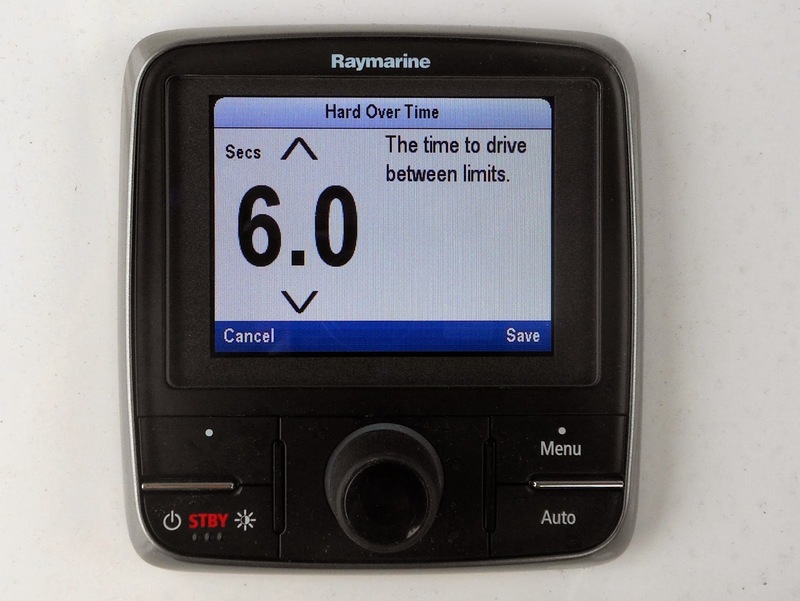 Another disappointment with the raymarine evolution system is the fact it will not steer a route stand alone, every waypoint arrived has to be confirmed before steering to the next. following along a river channel with many waypoints is far easier, safer and faster by hitting standby and steering manually! bomb49, It's hard to tell from afar exactly what is going on, but here are some observations. If the boat steer correctly to a waypoint, and if the "dodge" buttons turn the boat correctly the polarity is correct, so I would advise you don't need to muck with them anymore. A couple of points to consider. If a route has high density (close together) waypoints you can arrive before you're there. If my memory is correct the Ray factory default for the waypoint arrival alarm is .3 nautical miles (about 1800'). So if waypoints are closer than this distance, when the waypoint is activated, the system believes the new waypoint has already been reached. This can confuse the pilot. You might try reducing the alarm to .1 NM (600') and see if it behaves better. All mainstream autopilots require permission from the helmsman to go to the next waypoint in a route. This is because only the helmsman knows what the direction change magnitude is. A 5 degree direction change at 40kts won't surprise anyone, but a hard 90 degree change at 40kts could provide..... an interesting boating adventure at the very least, and bad things at the worst. So without seeing the route you're using, try making a simple route with three waypoints about a mile apart and see how the pilot behaves. Another perhaps more pragmatic approach would be to make and save a track that would live on the chart page with a happy color as a back up for hand steering. Cogitate on this and let me know . I want to connect my Garmin 541 but the Raymarine Adapter Cable - A06045 SeaTalk NG to NMEA 2000.
is only 16" long - way too short. Raymarine says it was originally 5'. Any solutions? Anon, It depends. If my memory serves me right, the ACU 100, doesn't supply network power, and the ACU 200 and up do. In either case you can install the Ray adapter cable you mentioned above with a Tee in the existing Ray backbone network, and then just buy an extension Garmin N2K cable to go the distance you need and plug it in. Anon, the problem is a classic case of not thinking ahead when specifying metric dimensions. That .04 of an inch is a problem. It will almost, but not quite fit into a 3 1/2" hole and enlarging it is a tedious P in the A. I don't have any great solutions other than to say I use a Rotozip to cut the hole removing the template line while cutting. It's a bit slower but works every time. I used a 4" hole saw. Wood was 3/4" think . No problem because the screws fit outside the 4" just use a bit of caution in placement. I have an older raymarine S3G autopilot on my 51 ft sailboat. It will not track a course and when activated turns the yacht wildly. As an older unit that needs repair, is it simply time to upgrade to this newer Evolution autopilot? I have installed an EV400 which i am trying to integrate with Nobletec 11.1. I have tried everything in all the setups for all the devices and can only get some sentences to cross over. I can get heading to the Nobletec, and depth from the Nobletec to the p70R, however i can not get any other sentences. I have tried selecting one sentence at a time to ease the translation through the Actisense NGW-1, but with no joy. The Actisense is plugged into the SeatalkNG backbone via a NMEA2000-SeatalkNG cable and the other end is spliced through a Keyspan adapter. When I view sentences on the Nobletec, it does not show any outgoing data to that port except DPT. When I set up another com port to an active Lowrance chart plotter the data log clearly shows a variety of incoming and outgoing sentences. I am now stumped and really hoping that I am just doing something wrong. Hi Jordan, here is what I understand from what you have said. You are getting data (depth) from the Nobeltech to the P70R, and heading from the autopilot to the Nobeltech. This implies the N2K/0183 link is working, at least to some degree, but the AP data (APB at the bare minmum) isn't getting through. You didn't say if the AP interface was working or not with the Lowrance, only there was more comm traffic. I think the place to start is to get the software versions for both the Nobeltech system and the NGW-1 and give Nobeltech a call for help. They are great at helping people through these interface issues. Hi, I've been looking for the proper installation specification for the tiller (Evolution) itself, however there was none in the box and I found non at Raymarine's site. Do you have a link to the desired sheets? I'm looking for info on the exact measures to drill the hole for the tiller pilot pin. I solved the problem with a parallel wooden tiller to which the raymarne was attached in 90 degree angles. I have a photo but not sure how to post here. Thanks Doug, you can send me the Pic (email addr is in my profile) and I will post it at the end of the piece with any comments you have. Hi Ron, the answer is yes. 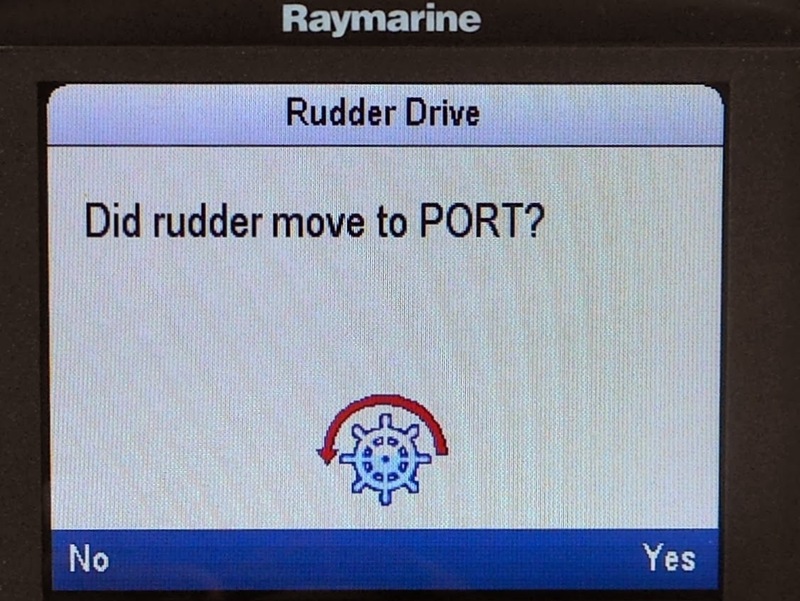 Is it possible to Control a Raymarine EV-1 autopilot from a Lowrance HDS gen2 MFD ? Hi Leif, the answer is yes. You just have to buy adapters to go from NMEA 2000 (Simnet) to the Raymarine version. If you don't have a NMEA 2000 network, you will have to put one together. Two resistors, and a power cable will be required. I have a new raymarine evo4000 autopilot installed on a trawler. It works for about 2 1/2 minutes and the says drive disabled. I can reset it and do it over and over. Do you have any advice. I am also using the smart controller and I have the p70 with knob. Hi Electronic Marine, the gauge isn't a problem. The case is aluminum and plastic and it's very low power. It barely registered any micro Tesla's at all as measured by my Gemeco app. Hi Bill. I'm considering upgrading my Ray ST5000 AP to a newer EV200. I've got twin 250 Yamahas on my boat. My question concerns your comment in a 2014 post about installation of a EV200 that you were not installing the supplied rudder sensor. Could you explain your reasoning? Will I be able to forego this step also with twins? I recently pulled my EVO200 from a twin inboard and installed in aboard a twin outboard craft. After dockside setting, I noticed when I turn the p70r dial to port, the engines turn as well. When I turn the dial starboard. The motors continue to want to turn to port. Don't remember the unit doing this on the first install a couple of years ago. Also, is there a remote that works with the Evo200 system? Anon, I would do a full factory reset and start over from scratch. Thanks for these great articles Bill. I have an E120W system and added an evolution autopilot a couple years ago. Now I'm planning to add an a78 mfd. I read that these two mfds are not compatible, so I plan to keep them independent. I'd like to disconnect the autopilot from the E120W network and connect it to the a78. Do you foresee any problems with this configuration and is there any way for both systems to share the EV-1 sensor core? I think it would help with the accuracy of the heading on the E120W and with radar overlay, etc. Anon although it is technically possible to connect both to the autopilot, I wouldn't advise doing it. The opportunity to have things go awry is too high, and it would require some less then cheap gear to do it. Stick with the a78 as the primary interface. Ray, I had to do some digging without any tangible results. The Actisense will take 0183 and convert to to NMEA 2000. 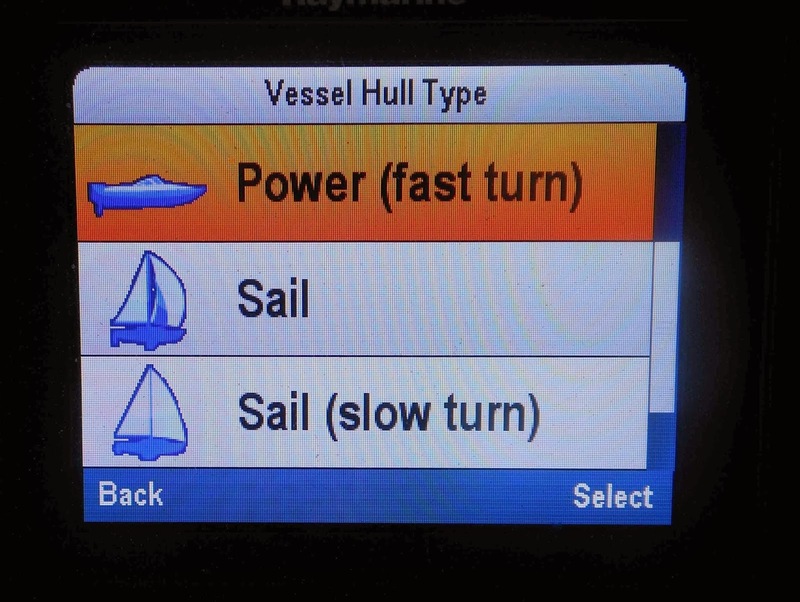 The Raymarine pilot is NMEA 2000. The red, yellow, black/bare sure sounds like legacy Seatalk wiring and you won't be using it. The Humminbird NMEA 1083 at a minimum (TX out of the Humminbird to RX of the Acticense) needs to be connected together. The Raymarine pilot I assume has a control head which is connected to the autopilot sensor over a small SeatalkNG (N2K) network. You will have to buy a Raymarine cable that has standard device net on one end for the Actisense and a Raymarine connector at the other end the network. I don't now if this is bare bones or you have a connector block, and what MFD you're trying to connect. If you haven't bought the Actisense Humminbird sells a N2K gateway and this would be a better option with no small fiddly wires. Despite downloading the manual I couldn't find a reference to the NMEA wiring. Feed me more info and I will try to help. My email address in in my profile. N2K Gateway - bought tried to use with Humminbird 999si to brand new EV-200 - "N2K Gateway is 1 way direction(inbound) to 999si" Waste of money and time for this. Buying a RayMarine and be done with it. N2K Gateway (blackbox) - bought tried to use with Humminbird 999si to brand new EV-200 - "N2K Gateway is 1 way direction(inbound) to 999si" Waste of money and time for this. Buying a RayMarine and be done with it. I purchase an EV-100 and Actisense NGW-1-STNG to connect to my Furuno RDP-139 which puts out 0183. How do I connect the gateway to the Furuno? Kris,a simple but complicated question. here is a place to start. You will need a NMEA 0183 cable. You may or may not have one already, and it may or may not be in use. If you have one, and it's only connected to one device you may be able to piggy back (share) the output with another device. If the gods were kind and the boat had a previously installed AP then you can use that cable. The Furuno site show a photo of a installation of their 0183 to N2K data converter. The Actisense unit is effectively the same device. 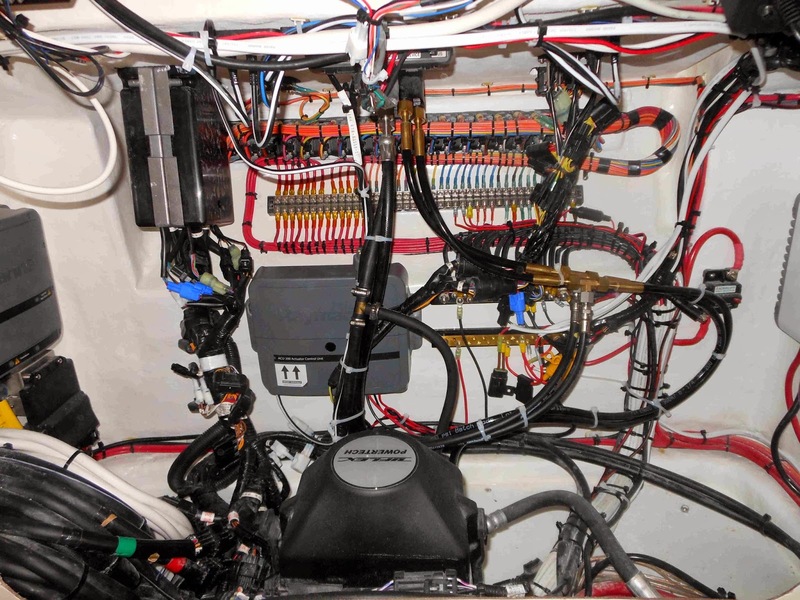 Your NavNet unit uses two wire +- NMEA connections. 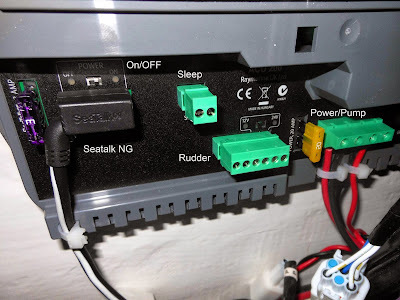 So you have the take the NMEA output from one of your ports and connect to the two NMEA input wire on the Actisense. So step one is to figure out what ports you have available. Download the installation manual for the RDP and take a look. Sorry I was not more specific as it would have saved you some time. I had a Raymarine S1000 autopilot previously connected so I have the RDP all set to send 0183 signal out. I was using he white for + and the shield for -. What I wanted to know is which wires on the Actisense to connect to? Secondly, to save a N2k junction, can I plug the EV1 into the P70 display as it has two rear connections and then into the backbone? I cannot find any information on the net that says. They are both white so I was hoping to use the second port. Hi, I'm planning on replacing my old Cetrek with the EV-150. I'm just wondering if you managed to use your old pump or did you have to get the Raymarine Type-1? Raymond, in theory it might be possible to do this. 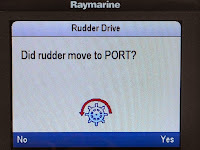 Raymarine's tech support site uses the term "typically" you wouldn't use the spx5 drive with an Evolution unit and implies a rudder reference would also be needed. I suggest you get the model and serial number of the drive and call Raymarine directly about this. Hi Bill. I have an old Tr1 Gladiator and am going to be upgrading to all new Raymarine equipment. I am looking at the EV-150 setup and was wondering if I can use my existing pump. Any thoughts? Thanks for your advice. Anon, I think in theory meaning I have never done is yes.The pump is reversing. I think you would ignore the shaft encoder wiring, and if my memory is correct just connect the twisted orange black pair to the ACU. I might test these wires with a 12VDC source to verify the pumps runs forward, and then reverse them to check it runs backwards. Thank you Bill!! I will try it out when the new equipment comes. Hi Bill , I have a question about my current installation. I have just fitted an evolution ACU200 pilot, which works very good indeed. I also have an existing lowrance NMEA2K network for my lowrance plotters ,radio and AIS.I have merged the networks together and everything seems to see each other on the network. But I am a little puzzled that the MFD wont control the pilot so as to follow a route etc. on the MFD I can see the live data on the EV1 , so they are communicating . just wondering if the Lowrance and Raymarine aren't fully compliant for using the autopilot control on the MFD. Would be a shame not to facilitate this feature if available. David, the N2K PGN's used by autopilots to talk with their control heads, and MFD's are all proprietary. I know it's possible to take the NMEA 0183 out (APB, RMC et al) data from the Lowrance, and using Ray's 0183 to SeatalkNG converter to get the info to the Evolution. In that case you would have to have an active goto waypoint in the MFD, and use the Evolution AP control head to manually tell it to "Track". That being said, below is a link from Raymarine's forum about interfacing a Garmin via N2K albeit with some requirements. This would likely be the same with the Lowrance. Hi Bill , thanks for replying , have just been for a test drive, and as you say the MFD wont control autopilot (which is probably Safer)but autopilot will follow a track to the chart way points, through the control head(p70r) so happy days. I'm a bit lost: p70, acu400, ev-1compass, antisense on STNG. 0183nmea from gps, ais through miniplex multiplexer to navigation pc. On pc opencpn sends data to multiplexer -> actisense -> stng. I have enabled RMC and APB output. All seems to work, speed xte cog is visible on p70 on Opencpn you can see HDG and rudderangle. When I enable track mode this seems to start fine, but randomly the SOG disappears on p70 resulting in "no speed data" error causing the AP go to "auto" mode instead of "track". I'm suspecting that the SOG is not updated often enough. Any ideas? Found the issue: The Multiplexer has a 128 bytes buffer, on which it stores the RMC and APB messages, this in fact is more the 128 bytes therefor discarding parts from sentences and possibly full sentences. Solution would be hardware flow, but since my favorite navigation software does not respect the settings on a COM port. I've contacted the the developer of the multiplexer and he explained the issue, but has send me a Shipmodul Miniplex-3USB-N2k, so I should be fine now. The messages will go straight to NMEA2000-Seatalk-NG port from the GPS and from the navigation software. Big kudos to http://www.customware.nl for hooking me up with a solution that works without charging me. I'm installing a acu 400 into a Beneteau 473 which has a quandangle operated by cables to the rudder and I've fitted a new lineal drive. Any ideas on how to mount the rudder reference transducer? Can it be mounted upside down if necessary? I've managed to install everything else however the rudder reference set up has me stumped. Any help would be much appreciated. Gavin, yes you can hang the rotary rudder reference upside down if need be. The other thing you might look at is seeing if Teleflex's "Smart Stick" Raymarine version could be adapted to work for you. Thanks for that Bill, the smart stick makes the setup so much easier. I read that the raymarine system should only have one power supply. I'm powering the backbone thru the ACU 400, what about the a series 9" mfd it comes with a power supply cable. In this case should I run power to both units? Hi Gavin, the general rule about N2K networks is they want power from only one source. What I do often is to take another power cable (red/black) and connect it to power and tie wrap it so it can be plugged into the network easily and without tools. The reason for this is if the ACU 400 dies an untimely death it takes out the network power with it resulting in no communications. That second power cable can then be plugged in. Thanks for that Bill and I was planning to do that. However I'm still unsure if I can connect up the mfd to power as well as the acu 400 up to power. Will the mfd power up and run from the power supplied from the acu 400 through the backbone? or should it have its own supply from the disribution board? Good read. My autopilot failed (fortunately just two hours before landfall). It was an old Cetrek 770. I'm thinking of replacing it with the Raymarine System. Just need it to talk to my Simrad NSS8 Evo2 plotter. Both are NMEA200 compatible so it should do. Another thing is the rudder sensor. I'm wondering if I might be able to use to my old one. It has four wires. A signal, 5v+, -0v, and a screen. Hi Carl and thanks.The Evolution autopilot will work with your EVO2 MFD's bearing in mind it need a N2K interface. It's doubtful your old rudder reference will work with the Evolution. Your option is to add the Raymarine rudder reference to the ACU or another solution is to add a N2K rudder reference. The only time in the past couple of years I've installed a rudder reference is for power boats that want to center the rudders while backing down into a slip. The systems are so good the rudder reference is becoming obsolete from a control input viewpoint. Ah my mistake. I'm sailing so it's the EVO1 compass, with the EV200 power unit controller. Presuming the power unit the NMEA2k connector, then I guess it is as simple (famous last works) as hooking up a cable between that and the 2K port on my MFD. Yes and you will need an adapter Ray part A06078 to go from Ray's SeatalkNG to the standard N2K device net connectors used by Simrad. Hi there, great thread. Can I connect to my hds gen2 directly to the spare connector on the back of the p70r. Using a A6075? In theory yes... Ray does do daisey chaining sort of. It should be just another device on the network. Thanks. If I install like that do I disconnect power from hds? I comment earlier in the this post, but just want to say thanks to Bill for sharing his installation. It helped me with mine. I've documented mine on mu blog below with a link back to this page. Hi Carl. Did you connect your chartplotter directly to the back of your pr70. Did you leave the power connected to your chartplotter? I connected the Simrad plotter to the Seatalk network using a SeatalkNG to DeviceNet cable. Power for the P70s comes from the Seatalk network, which in turn is powered by ACU200. The chartplotter has its own power source. Could someone tell me what sort of NMEA 183 string the ACU400 accepts. I have NMEA 183 to 2000 converter but my nav system needs to know which NMEA string to send out. Actually it's the flying saucer shaped unit that is both the processor and compass module. Input RMC and APB. That typically does the rest. Inhibit all the others if you can. At the end of last season I replaced my Raymarine ST5000+ with a P70S, EV-1, ACU200 autopilot. The original installation went well although I did take some time, with Raymarine help, to resolve a "No Navigation Data" problem. The AUTO and WIND VANE modes work well however I am having difficulties following waypoints in TRACK mode. As I approach a waypoint my Garmin 3010 plotter advises me that I am approaching the waypoint. On the P70S I see the DTW count down to zero at which point the boat veers to port. Then I receive a prompt on the P70S for the next waypoint. I accept the prompt and the boat swings round to follow the new course. 1 Why is it doing this? 2 if there is any problem with the delivery of the new waypoint data from the plotter should not the auto pilot fail safe and continue on its original course? I have read earlier comments in your blog about waypoint approach behaviour and it may be that my waypoints are too close together but it does not explain why the autopilot reacts in such an unpredictable and potentially hazardous way. I send Garmin GPS data to the autopilot via an Actisens NGW-1 gateway. It is almost as if the P70S/EV-1/AC200 is getting the navigation data after it thinks it has reached the waypoint but if this is the case I would expect the autopilot to maintain its course along with an appropriate alarm to await human intervention. It's hard to exactly say what is happening. My first thought is appears you are feeding two different pieces of information to the AP from two different sources, the Actisense and via other via Seatalk. I don't understand this configuration. In theory 0183 is converted to N2K by the Actisense which the AP will understand. If my memory serves me the 3010 allows you the select the 0183 sentences that are transmitted by the MFD. The first one needed is RMC which includes L/L and the second is APB that provides the balance of the needed AP info. I'm not sure what the 0183/ST converter's role in this is other than you might have other Ray devices in the mix. Typically the arrival at a waypoint is determined by the waypoint arrival alarm distance and this will stop navigation at that time triggered by the alarm. Using a route the next waypoint will cause the the system to send APB with the next WP's data. You can have waypoints too close together. If the distance to the new waypoint is less than the alarm distance then that waypoint is believed to have been already reached and the next waypoint become active. I most often see this when a curvy track is converted to a route. Navigation is alway done in straight lines. When a curve is converted to a route the MFD has to convert it to a polygon and this can have some unpredictable results causing waypoints to be too close together. I'm not sure why the vessel serves to port. This could occur because the AP has stopped navigating and theis in the natural result of leaving the helm unattended, or the pilot is doing this. I need some more infor. I would start by shortening the arrival alarm distance and see what happens. 0183 is operating at 4800 baud and hence it's not moving data at a blinding speed. I would also block any NMEA 0183 sentences that aren't being used. Thank you Bill. I have resolved the problem by routing GPS (GGA,GSA,GSV,RMC) and Autopilot (APB,RMB) sentences through my Actisense NGW-1 at 2400 bps. I think the problem was with my old Raymarine RS232 Seatalk 1 converter which was just too slow. For information I am running with a beta version of the Actisense NGW-1 firmware which can handle Fast Header data from my EV-1 sensor. I have routed this to my Garmin plotter and have been able to uninstall my old KVH Fast Heading Compass. I expect Actisense to make this update available soon. Thank you agin for your help.